The major forecasting models, along with the National Weather Service, are in general agreement that needed rainfall of 1-2” will impact the Central and Eastern Corn Belt in the next 5-6 days. This will provide some near term relief, though as is evident in Nebraska, it’s been an unusually warm June. Temp records have been broken, and vegetation health has been plagued in recent weeks by either heat or dryness, or in the case of the Eastern Midwest a lack of crop growth. 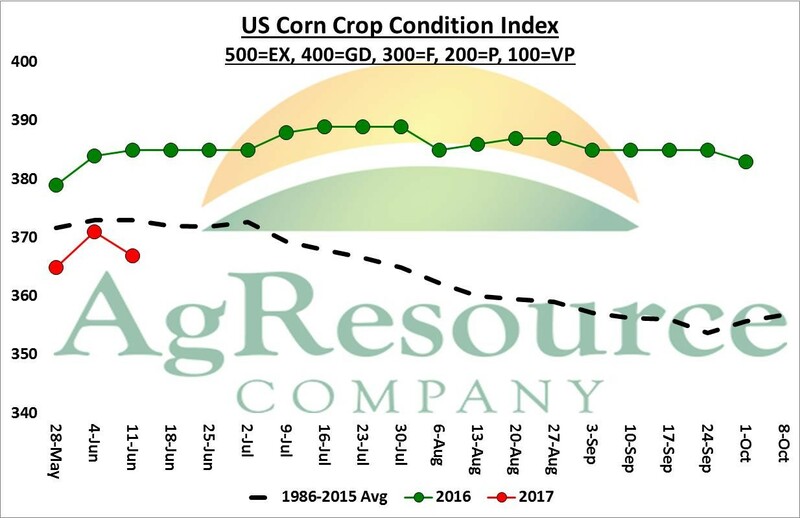 Crop conditions as of Sunday are decent, but hardly spectacular, and our work suggests that GD/EX ratings need to rise above 70% by early July if US corn yield is to exceed 170 Bu/Acre. It’s possible, but we’re concerned by the lack of any meaningful pattern shift across the Western Corn Belt, particularly across KS, NE and the Dakotas. As such, like hard red spring wheat last week, it’s time to start going through probable scenarios. It’s our opinion that, as of now, the US corn crop is getting smaller, not bigger, and this indicates potentially important balance sheet changes lie ahead. 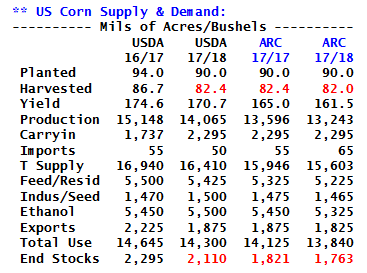 Most importantly, it’s rather easy to forecast US corn end stocks well below 2.0 billion bushels – note that a yield of 165 Bu/Acre is just 3% below trend, which if high temperatures continue in the 90s and low 100s through the balance of June, such a yield becomes probable rather than just possible. End stocks of 1.7-1.8 Billion, in turn, suggest a seasonal average cash price closer to $4.00, and as such we advise patience with respect to new cash sales. The current weather pattern is the first real threat to US corn yield seen since 2013. Sign up for an AgResource trial to get weekly updates on crop conditions, and how they affect our US corn yield model. Midplains Ag will be hosting market update webinar June 20th. Stop by the office on June 20th at 7:30 for a live chat with Ben Buckner about the current market outlook.